mary ann tenuto of the chiapas support committee speaks with i.t.a. it has been eighteen years since the zapatista uprising. what is the situation like in chiapas today? In a nutshell, what is occurring throughout Chiapas and especially in Zapatista territory is a struggle for territory. It is a struggle between the Zapatista and other campaign communities and the transnational corporations for land with resources. The corporate interests seek land and territory for mining, agro-fuel plantations, water and precious woods. The situation in some parts of Zapatista territory becomes more difficult every day. 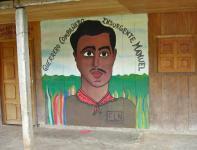 The Zapatistas are focused on constructing autonomous governance and projects, like education, health and production. The government, in collaboration with transnational corporate interests, is waging a low-intensity war against the autonomous governments. This has two sides to it: the softer side, whereby the government entices people and communities to leave the Zapatista movement with money and economic projects or health clinics; and the violent side, where violent evictions of Zapatistas from their communities are part of the counterinsurgency. the board of good government in le realidad has made reports of a series of unprovoked attacks and threats of land dispossession made towards ezln members as late as august this year. who is behind these attacks and what are their motives? In August, the Good Government Board (it is commonly referred to as “the junta”) of La Realidad denounced an attack on the Zapatista coffee warehouse near the San Carlos Ejido by members of two political parties, the PRI and the PVEM. These political party members put up a fence around the warehouse and cut off its electricity in an attempt to take the warehouse away from the Zapatistas, who store and sell their coffee products there. This is part of the low-intensity war against the autonomous communities. The PRI and the PVEM took power in the July 1 elections in Mexico and have been emboldened by their victory. The controlling factor is that the government does not punish the groups that attack the Zapatistas. They have impunity. the uprising of january first nineteen, ninety four was a movement of indigenous campesinos revolting against neoliberal capitalism. what sparked this uprising and what were the conditions that led up to it? The conditions that led up to the Zapatista uprising were, for the overwhelming majority of the Zapatistas, conditions of extreme poverty partially caused by a lack of land for growing the food with which to feed their families. Another cause was extreme racism against indigenous peoples in Mexico and Chiapas, which is now 80% indigenous. Plantation owners first enslaved the indigenous peoples and later used them as serfs. The state was still emerging from a form of feudalism with indigenous peoples as the serfs. 50% of indigenous children died before reaching 5 years of age because of malnutrition and a lack of health care. Armed private security guards working for plantation owners were stealing what little land the indigenous peoples had with violence. The government provided virtually no public services, like health care for example. much has been made of the zapatistas’ usage of the internet at the time of the uprising which allowed them to connect with ngo’s across the globe who gave them support. did this lead to the initial success or is there more to it than that? I think the usage of the Internet permitted the Zapatistas to spread the word effectively and continuously after the corporate media tired of Zapatista news and/or figured out that the Zapatistas were against their corporate interests and those of Wall Street. Perhaps the “more than that” has to do with their analysis of neoliberalism, previously not even heard of in some parts of the world. As the movement evolved, their construction of autonomy provided an alternative for changing the system or opting out of the system without an on-going violent revolution to take power; in other words, an alternative for the Left. what were the original objectives of the ezln and how have these changed over time? Initially, the Zapatistas made certain basic demands of the Mexican government: land, housing, jobs, education, health care, roads, electricity, sewage systems, etcetera; in other words, all the government services that the government had failed to provide. But, during the first year of the rebellion, the Zapatistas formed 38 autonomous municipios (municipalities) and in the peace talks that began in 1995, the first topic for discussion was indigenous autonomy for all indigenous territories of Mexico. An agreement was reached on that issue. It is known as the San Andrés Accords. The government of Vicente Fox presented it to the Mexican Congress, which did not pass the accords that were agreed upon. It watered them down to be almost completely meaningless. Since the congressional betrayal, the focus of the Zapatistas has been on their internal construction of autonomy. does the ezln consider itself a marxist, anarchist or a unique type of movement. what is their basic ideology? how does this organization differ from others? This is a question on which people don’t always agree. My personal perception of the Zapatista “ideology” is that it a mixture of ideas and principles taken from various Mexican revolutionaries (Zapata, Villa, Flores Magón), liberation theology and some of the lessons from other Latin American countries and adapted to their specific situation of oppression and indigenous culture. Indigenous culture plays a dominant role. It would seem like their style of autonomous governance and direct participatory democracy is compatible with some anarchist principles, while their internal economy is socialist. I believe they adapted these various principles to their cultural values. an internal uprising occurred within the ezln ranks in nineteen ninety three when a revolutionary law for women was implemented by women. how is life for women within the zapatista movement and how does it differ compared to women living in other similar communities? Life for women within the Zapatista movement has changed. They are now allowed to vote in community assemblies, hold positions of responsibility in the Zapatista organization, attend school and women’s health care is a priority. These are big changes. They can also choose their own husband and decide how many, if any, children they want to have. The implementation of the Women’s Revolutionary law has been easier in some Zapatista areas than in others. I don’t know how to compare it to non-Zapatista communities because in those I am familiar with women have those same rights because they are part of an independent campesino organization. In some traditional communities women do not have those rights. the figure of subcomandante marcos looms over the zapatista movement; he is their revolutionary spokesman who himself is not an indigenous person. what occupies the subcomandante at present and what is he working on in twenty twelve? I have no inside information about what “El Sup” is doing. However, the security of the Zapatista communities is a major concern now. 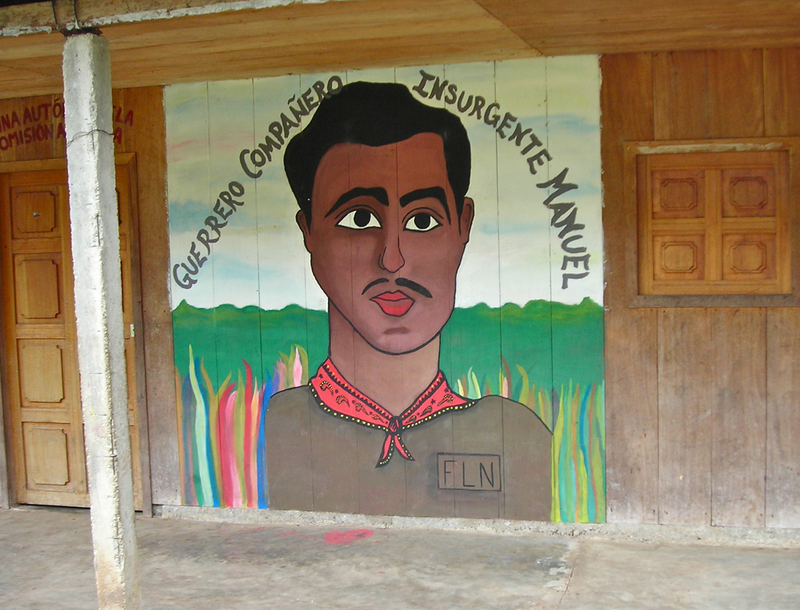 The CCRI (the Zapatista movement’s commanders), which includes Marcos, is most likely focused on protecting the communities against an expected onslaught from the PRI. The CCRI is the Zapatista political/military governing body. (The good government juntas are the civilian governing bodies.) Marco may also be involved in plans for January 1, 2014, their 20th anniversary! in two thousand and three the good government committees (juntas de buen gobierno) were established in chiapas. how are these operate and how do they co-ordinate the autonomous regions? The Juntas are the regional civilian government in the 5 Zapatista regions. They resolve disputes that cannot be resolved at the local level (community or municipal level). They resolve disputes between husbands and wives, land disputes, disputes between Zapatistas and non-Zapatistas. They also oversee the distribution of funds received from NGOs and collectives. They decide who is and is not permitted within Zapatista territory. in two thousand and six subcomandante marcos, in the guise of delegado cero, toured mexico in what became known as the other campaign. what were the objectives of this campaign and how successful was it? The objective of the Other Campaign was to form a national civilian campaign to politically support the EZLN and hold a meeting to decide on a new constitution for Mexico. It was timed to draw a contrast to the presidential electoral campaigns of 2006. Initially, the Zapatista delegation drew enormous crowds and many people joined. However, the police terrorism against San Salvador Atenco unleashed violent repression on one of the Other Campaign’s most active and admired members and put a stop to the Other Campaign tour. After the new president (Felipe Calderon) took power in December 2006, he sent the Mexican Army into the streets to perform police functions and that led to the violent and deadly “Drug War,” which made safe travel impossible for the Zapatita commanders. In the short term, I think the Other Campaign had some success in uniting folks who shared Zapatista ideas. However, in the long term, I’m not sure it accomplished what the Zapatistas hoped for: a large national social movement led by the Zapatistas to peacefully transform Mexico. after all these years what do you see as the significance of the zapataista revolt? The first and by far the most significant gain to the Zapatistas is the recuperation of somewhere between 750,000 to one million acres of land for distribution to land-hungry indigenous campesinos belonging to the Zapatista movement. This has enabled Zapatistas to have enough land on which to grow food for their families and thereby decrease malnutrition and death. There is also enough land on which to grow a cash crop to provide income with which to buy other basic needs. Although the communities are still poor, the horrendous conditions in which they previously lived have been somewhat alleviated. The second significant influence is the implementation of autonomy. Their construction of autonomous self-government provides the Left with an alternative to violent armed struggle for the purpose of taking power. in what way have they influenced other movements and in which movements has their influence been felt? The Zapatista analysis of neoliberalism has inspired movements around the world, as well as their analysis of government, political parties, “democracy” and most recently wars. The Zapatistas are believed to have inspired the formation of a World Social Forum. They are clearly the inspiration for indigenous movements in Mexico and the entire American continent (both hemispheres). Their influence is seen in the US Occupy movement and the new #YoSoy 132 movement in Mexico. Many European movements have also been inspired by the Zapatistas and they maintain relations with many important movements around the world. what are the challenges for the zapatista movement in the future and what changes do you anticipate? The July 1, 2012 election returned the PRI to power. The PRI is expected to respond more violently to protest from social movements than the PAN has for the past 12 years. The PRI thinks it has a score to settle with the Zapatistas on whom it blames the 2000 election defeat of its 70-year rule in Mexico. Many in Mexico believe that the Zapatistas are in for a violent counterinsurgency against them under the PRI. I expect security to tighten in Zapatista communities and the need for national and international solidarity to increase. The Chiapas Support Committee (CSC) is a grass-roots all-volunteer collective in Oakland, California founded in 1998. We serve as a center for information about Chiapas, the Zapatistas, Mexico and the Other Campaign. Our mission is to provide information on human rights issues in Mexico and to provide financial assistance to communities that are victims of human rights abuse. In the Bay Area, and elsewhere in California, we provide public information by sponsoring community events and attending community festivals. Our newsletter, our information list and our blog (http://compamanuel.wordpress.com/) provide information not only to the Bay Area, but many parts of California, the United States, Mexico and throughout the world. At the end of each month we send out a summary of key news items from that month to our info-list. We organize a human rights delegation to Chiapas each year and we are authorized to accredit US applicants who wish to study Spanish or a Mayan language (Tsotsil) at the Zapatista language school in Oventik, Chiapas. Proceeds from the language school help support students at the autonomous Oventik secondary school (middle school). In Mexico, we support and accompany indigenous and campesino communities. We have a partnership (hermanamiento) with San Manuel autonomous zapatista municipality in the region of the Caracol of La Garrucha. We are currently working with the Good Government Council in La Garrucha on an education project that encompasses all four autonomous municipalities in the region. The project’s purpose is to provide the funding for building schools and buying school supplies and teaching equipment. Our delegations visit the schools that have been constructed. We have supported (since 1998) and continue to support the internally displaced Zapatistas in refugee camps located in San Pedro Polhó autonomous municipality in the Highlands. We buy artesanía and other products from the women's weaving cooperative in Polhó, as well as from other Zapatista cooperatives, to support Zapatista production efforts. Internationally, we are part of the international segment of the Other Campaign.